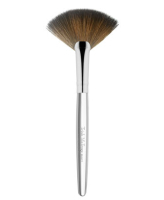 If you’re new to the wild world of makeup, you may ask yourself: What is the point of a fan brush? Actually, the answer is all of the above, and all women — especially us makeup lovers — could greatly benefit from a lighter hand sometimes. 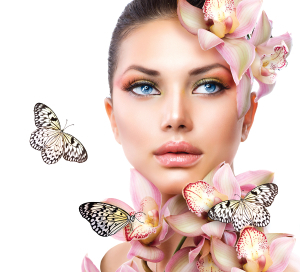 And that is precisely what a fan brush offers: A light, butterfly-kisses approach to makeup application. Many women think of a fan brush as a frivolous novelty brush. NOT SO! In fact, fan brushes are drastically underrated and underappreciated, and we wish more brush makers would sell them, as there’s a lot of potential for more variation in design. Why? A fan brush is actually a great multi-tasker. 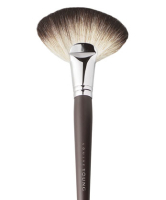 For starters, it’s a bit more goof-proof than other brushes. With fan brushes: There’s usually no super-matte-powdered-down-clown look. There’s no harsh line when contouring. There’s no Oompa-Loompa over-bronzing. There’s no ice-princess over-highlighting. 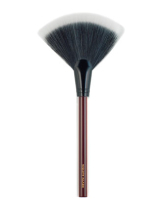 And while you can use many kinds of brushes to knock off fallout from eyeshadow, this is also the best brush to lightly fling away particles without causing streaks. The other great thing about fan brushes: You can get a perfectly good one on the cheap! E.L.F. Studio Fan Brush ($3.) 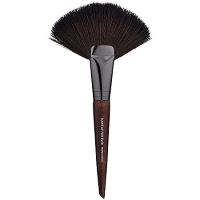 Who can’t afford to try a fan brush at this price? 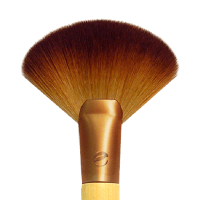 EcoTools Deluxe Fan Brush ($6.99.) We actually recommend this one to start with if you’ve never used one before. Some people say the density of the ELF brush is a bit too light. 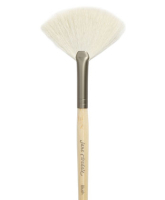 Jane Iredale White Fan Brush ($18.) Pretty, oh-so-pretty. 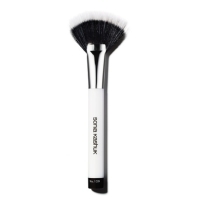 Louise Young LY 20 Super Fan Brush ($42.) This one is more dense than some of its competitors and has a little cult following! Gaia over at The Non-Blonde loves this one. 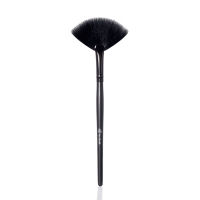 Make Up For Ever 134 Large Powder Fan Brush ($48.) Made by French brush-maker Raphael.